Quality photography is a must for digital marketing. But professional photography may not be in the annual budget for small business owners looking to make their mark on the web. The experience and equipment that pro-photographers bring to the table make an impact for sure, and it is difficult to replicate that. But photography has been democratized by the technology available to amateurs, the most ubiquitous of which is the phone camera. Here’s how to make the most out of the tools available to keep your business’ imagery sharp and lively, without breaking the bank. Phone photography is getting better and better and it is an accepted way to capture and share photos on websites and social media. With the availability of effective (and fun) editing apps, it’s seamless to go from snap, to edit, to publish all from the palm of your hand. Even pro-photographers acknowledge “the best camera is the one that’s with you.” That means the phone that follows wherever you go is your go-to camera. It’s always there for you when a photo opportunity arises. Even a few tweaks to how you set up the composition of the photo can take it from good to great. Have it ready as you go about the daily activity of running your business. Never miss an opportunity to capture a fun, behind-the-scenes moment. Your social media pages, email newsletters, blog, and website all hunger for fresh imagery. Having your phone at the ready will help satisfy them. How do you create photo opportunities? One sure-fire way is by hosting events. Event marketing has its own rewards beyond yielding great digital marketing imagery, but photography is absolutely one of the benefits of a successful event. If your business lends itself to community gatherings, product-launches, or other ways to draw a crowd, make sure to leverage the opportunity! If not, take advantage of other occasions that are photo-worthy - a company picnic, a business anniversary, or even an employee exploring the city or neighborhood in which you are located. A planned event means you will also be ready with a more professional camera, capable of taking more focused and professional looking images. Look for moments that encapsulate your brand’s image. Focus on people and expressive faces, and capture a mix of set up and candid shots. Photographs of your own staff at work, or people at events is a great way to mix-up your social media feeds. A combination of posts that not only showcase your products, but also your company culture, is a perfect way for people to connect with your brand. Photographing people gives you the opportunity to tag them on social media when you publish the photo - a free and effective technique for amplifying the exposure of the event and your brand. Pictures of customers using your product or service make for images that are useable across your digital marketing assets. But you are unlikely to be there for those moments! The solution is user generated photos. Put out a call to your customers for images of them using your product. Make a fun contest around customer submitted photos to spur humor and creativity. This can also be accomplished through social media hashtags. Encourage your customers to use a specific hashtag when they post photos with your products. Following these hashtags is bound to put a smile on your face and give your business a trove of awesome photos! Generating photos from your customers not only satisfies your need for marketing collateral, it also promotes brand loyalty and customer engagement. Photos are a lifeblood of digital marketing. 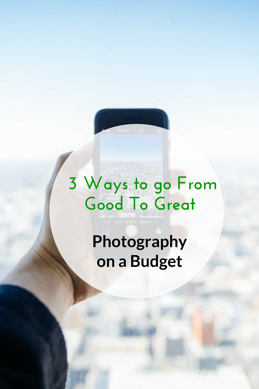 Use today’s technology to generate great photography on a budget to enliven all of your digital channels. Editor's note: Originally published in 2017, this article has been edited and updated in January 2019.